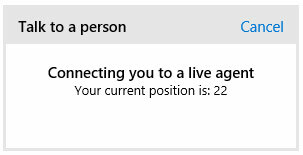 If you’re using Windows 10, your computer has the built-in ability to bring up a chat window so you can communicate with an actual person from Microsoft. You don’t have to go to their website, and you don’t have to pick up your phone. All too often, someone will contact me about a computer problem, and the conversation starts with that person saying, “I was just talking with Microsoft on the phone, and they told me…”. At that point I already know what has happened. In most cases, I’ll let them continue and tell the rest of the story though. A lot of these people really want to tell me the details. Did you allow this person to remote in to your computer? Did you give this person your credit card number? The answers to those two questions will determine how we proceed. I still find it pretty amazing that people will still believe and trust a random stranger on the phone who claims to be with Microsoft, even though the scam is so widely known now. But what if you need to actually talk with someone who really does work at Microsoft? Maybe you got a new computer, and you’re trying to install Office 365, and it keeps coming up with an error. Well, Office 365 is a Microsoft product, and you paid them money for it, so they should be available to help you install it, right? Of course. Rule #1 is don’t do a Google search to find their phone number. If you do that, it’s very likely you’ll be talking to another scammer. And the truth is, you don’t even need to call them at all. 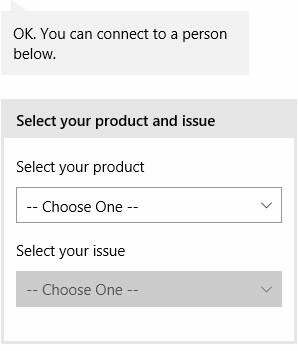 And you don’t need to try to navigate the Microsoft website trying to get to tech support. 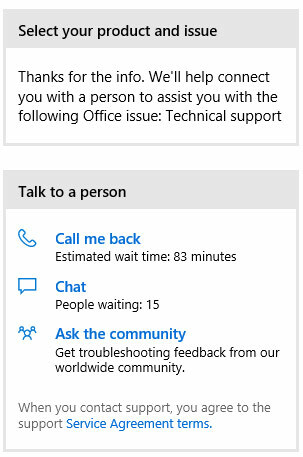 You can bring up a Microsoft tech support agent in a chat window – right from your computer. 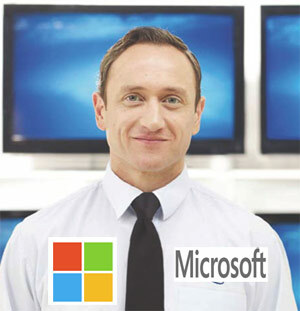 Don’t get too excited yet though, because you still haven’t contact a real person from Microsoft. This is just their artificial intelligence robot that they would like you to try to use first. 4. At this point, you can try typing your actual question, such as “I can’t install Office”. But that means you’re going to continue to have to work with the robot as it tries to figure out what your problem is. 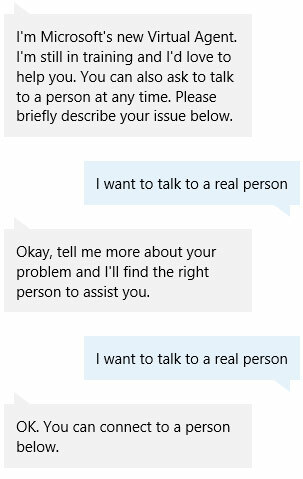 Instead, if you want to get to a real person, just type “I want to talk to a real person”. Then type it again. So just choose the proper selections. In this case, in the first menu you would choose “Office” and in the second list you would choose “Tech Support”. Then you get to find out how long you’ll be waiting. In this example, it was prime time – 8:30 pm on a weeknight – and I would have either been waiting about 1 1/2 hours for a call back by phone, or for the 15 people ahead of me in chat to get finished. I usually prefer to use the chat window, since I then have a record of the conversation that I can refer back to if needed. And I don’t have to try to understand what the agent is saying if his non-US accent makes conversation difficult. When you choose Chat, you’ll see a countdown so you’ll know when it’s getting close to being your turn. For some reason, even though there were 15 people ahead of me, in the chat window my position was 22. Not sure how that happened. 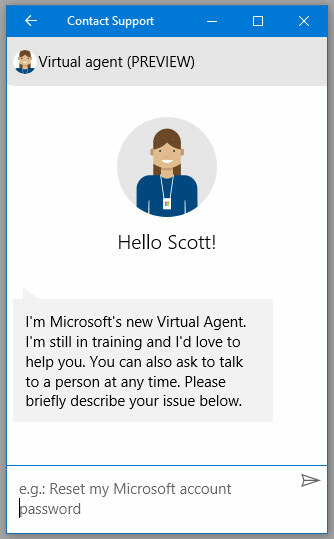 When your turn comes up, you’ll actually be chatting with a real live person from Microsoft! Well, more likely someone working from their home in India or the Philippines, as a contractor for Microsoft. But at least you’ll know you’re not speaking to a scammer.